Mindfulness made its way mainstream over the last few years and men and women of all ages are reaping the rewards of practicing it. Read below to learn more about why wellness experts are predicting it will be a top trend in wellness in 2018 and how you can embrace this centuries-old concept. Mindfulness by definition is a mental state achieved by focusing one’s awareness on the present moment, while calmly accepting and acknowledging one’s feelings, thoughts, and bodily sensations, without judging them. Mindfulness is synonymous with alertness, conscientiousness, concentration, and presence. It is used as a technique by mental health practitioners to reduce stress and anxiety and it can take on many forms. Perhaps the most popular or well known form of mindfulness is meditation. Not to be confused with your mind being full, mindfulness is a focus on the here and now, on what is happening and unfolding right before our eyes, without the need to fix or do. You may feel that you spend so much of your life feeling like your mind is literally full with projects, reminders, and to-dos. Perhaps the best representation of this was the the e-card that floated around the internet a few years back that was designed to give men a glimpse into what a woman’s mind is like. The analogy of a browser window with 3000 tabs open constantly was used and was powerful. The problem is that when your mind is full, you leave less room to focus on the present. Instead, you are focused on what has happened in the past and what is to come in the future, and unfortunately, that means the present gets lost in the shuffle. You are likely distracted, disoriented, and may have a hard time concentrating. You may be thinking that spreading your energy around is what allows you to be most productive. Recent studies suggest though, that not only is that not the case, but it can actually make you even less productive because of the amount of juggling your brain must do in order to accommodate your herky jerky moves from one thing to the next. As an example, you may spend a few hours at work working back and forth between e-mails, conference calls, and a few projects. Sound familiar? In addition to its impact on your quality of work and productivity, multitasking has also been shown to increase the production of cortisol, our body’s stress hormone, leaving you feeling more anxious and stressed while getting less done. So why do we multitask? In addition to the societal influences on our work habits, completing small menial tasks can trigger the brain to release dopamine, which is the feel good hormone. When you see that e-mail come into your inbox, and you quickly respond, dopamine is released and your mood improves. It can even become addicting. Over time though, the dopamine release can’t overcome the impact multitasking has on productivity, concentration, and even more importantly your ability to be present in the moment. Our to-do lists are bound to stay long, life is bound to continue happening, and if you’re a Type A, perfectionism will likely always be a double edge sword for you. The more mindful you are, the more likely you are able to flow through life with a bit more ease, accept imperfections, and acknowledge all that you have to be grateful for. What are some ways you can be more mindful? Breathe. It seems simple but acknowledging and focusing on your breath can help reduce your stress and anxiety and help clear your mind of distractions. Simply come to a comfortable seated position, close your eyes and after taking a few deep breaths, try out a 4 part breath. Breathe in for 4 counts, hold your breath for 4 counts, exhale for 4 counts and then pause for 4 counts. Repeat for 10 breaths. You can even use a condensed version of this technique whenever you are feeling particularly stressed or an extended version when you have the time. Deep breathing signals the parasympathetic nervous system to take over, putting your body in a state of calm and healing, while lowering your heart rate and blood pressure and slowing your breath. Meditate. The idea of meditating can seem intimidating and overwhelming if you haven’t done it in the past, until you realize that meditation actually involves doing nothing. How amazing does that sound after a holiday season full of hustle and bustle? Meditation simply involves tuning in to the ongoing conversation happening in our mind and allowing our thoughts to enter and exit without judging them. It is through meditation that we are able to train and re-train our minds to accept calm, clarity and silence even when that ongoing conversation in our mind can get pretty loud. If you are looking to get started with a meditation practice, there are a number of free apps you can download that will guide you through the process. Check out Insight Timer (free) or Headspace (monthly fees may apply) for beginners and veterans alike. Within each app, you can filter based on your interest, length, goals, and other factors. Meditation for even as little as 5-10 minutes per day can be beneficial. Single-Task. It seems so simple, but the days fly by and in a world of constant connectivity and jam packed schedules, we are always doing more and in many cases accomplishing less than ever. We are more tired, stressed and sick than generations before us. Try doing one thing at a time. When it comes to work, specifically, or bigger projects or task around the house, block out time for that specific task, and stick to that task only for however long you have specified. This means setting a timer and shutting down e-mail, closing your browser, and putting your phone down until the timer goes off. This technique was actually coined almost 40 years ago and is known as the Pomodoro Technique. Exercise. One of the best ways to “get out of your head” is to get into your body by moving. Many forms of exercise including barre and yoga involve a mindfulness component which can help bring you to the present moment and help silence the noise you are hearing in your mind. Have you ever had that zen like feeling when you leave a barre or yoga class after arriving to the same class feeling more stressed than ever? Barre class (and others) require you to stay laser focused on what you are doing in the present moment, therefore helping remove distractions and allowing the mind to focus on exactly what you are doing. 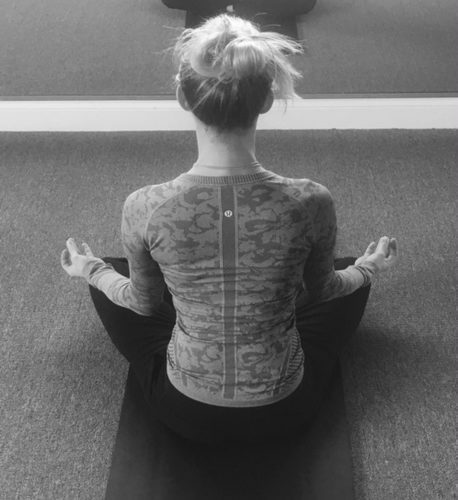 The constant changes in routine from class to class, and quick transitions from one exercise to another, leave little time to allow the mind to wander or focus on what is happening outside the studio, hence incorporating elements of mindfulness, leaving you happier and less stressed than when you arrived. Additionally, your focus on exactly what you are doing allows you to get more out of the workout and work to your greatest potential physically. Ditch your phone. Do it, no matter how daunting it may seem, even if for short periods of time. This will allow you to engage in conversation without distraction, play with your kids or grandkids without buzzing or beeping, and give your eyes and mind a rest from the screen, the apps, and the constant flow in and out of information. As you can see, techniques and practices designed to help you become more mindful are simple, inexpensive, and require little to no equipment or tools. If one of your resolutions, goals or intentions in 2018 is to be more mindful, these are a few great ways to get started. Feel free to share your tips and tricks for being mindful in the comments below! This is great Meg! I’m going to try a few of those mindful tips for 2018:) Thanks!! Love this article, Meg! All great ideas to keep in mind, especially heading into the new year!